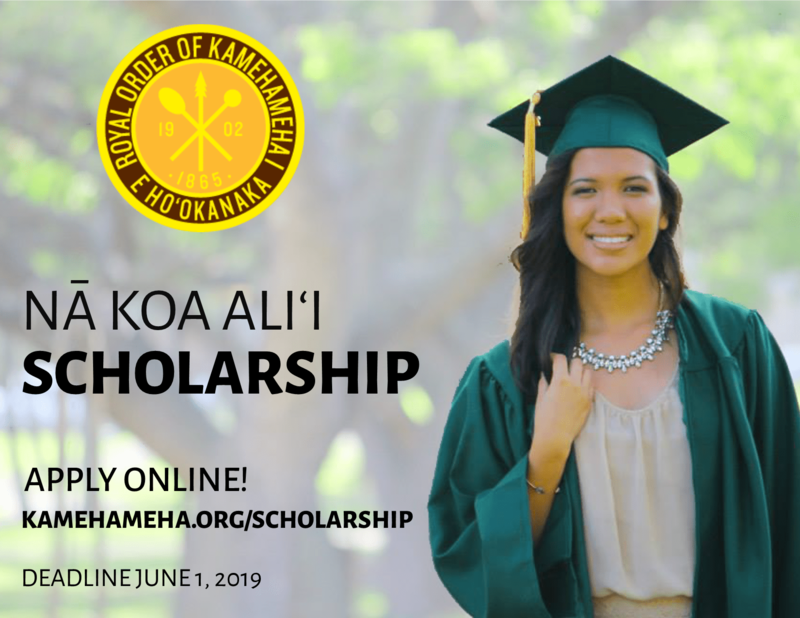 The Royal Order of Kamehameha I, Hawaii Chapter 1 is now accepting applications for the 2019-2020 Nā Koa Ali‘i Scholarship. Information and the online application for the Nā Koa Ali‘i Scholarship can be found http://www.kamehameha.org/scholarship/. This year’s Nā Koa Aliʻi Scholarship is made possible by the generous contributions of the Regina Kawananakoa Trust, Native Hawaiian Veterans LLC, Kinaʻole Foundation, and members of the Royal Order of Kamehameha I. Please feel free to share this email with your family, friends, and potential applicants. The Nā Koa Ali‘i Scholarship is a merit-based scholarship grounded in the values and beliefs of the Royal Order of Kamehameha I. The purpose of the Nā Koa Ali‘i Scholarship is to provide financial assistance to full-time post secondary students of Hawaiian ancestry who are pursuing a degree at an accredited vocational school, or a two-year or four-year institution. Preference will be given to members of the Royal Order of Kamehameha I and their immediate family members. Two(2) scholarship awards at the amount $1,000.00 will be awarded annually. Previous awardees may reapply for the Nā Koa Ali‘i Scholarship. Awardees are chosen based on scholarship criteria and essay quality. Awardees are determined by the Nā Koa Ali‘i Scholarship Fund Selection Committee. Awardees are required to complete 20 hours of volunteer work with an organization that serves Native Hawaiians within the academic year. Must have a High School Diploma or General Education Diploma(GED). High school seniors expecting to graduate this academic year are eligible to apply. Attend an accredited vocational school, or a two-year or four-year post secondary institution. Be a full-time student, as determined by your institution’s financial aid office. Preference is given to good standing members of the Royal Order of Kamehameha I, and their immediate family members. Complete two essays (500-word limit per essay) that address the following two prompts: 1) Write an autobiography discussing your education, work experience, personal interests and talents, and community service. Discuss how you have demonstrated leadership ability or potential in your life. 2) Describe your education and career goals, and explain how/why this scholarship will be beneficial to you. Essays may be submitted in ʻŌlelo Hawaiʻi or English. Applicants are required to submit a completed online application. Incomplete online applications will not be considered by the scholarship committee. Please carefully complete the personal information and academic information (name, date of birth, etc.). Be sure your information is accurate for notification and verification purposes. Applicants are encouraged to type essay responses using a word processing program with attention to the 500-word limit per essay. Essay responses should then be pasted into the online application for submission. Essays may be submitted in ʻŌlelo Hawaiʻi or English with attention to proper grammar, spelling, and punctuation. Please prepare the following documents for upload before you begin your online application. An image of the applicant. The image should clearly show the applicant’s face; do not submit a group photo. A PDF of a certified copy of applicant’s birth certificate showing Hawaiian ancestry. The applicant will be notified by the scholarship committee if additional information is needed to validate the applicant’s Hawaiian ancestry. A PDF of the applicant’s most recent transcript. All online application fields with an asterisk(*) are required and cannot be blank. Be sure to review your online application before submission; online applications cannot be modified after the online application has been submitted. A copy of your submitted application will be sent to the email address you provided in your online application. Application opens on February 1, 2019. Application deadline is June 1, 2019, at 11:59 PM. Awardees will be notified by June 21, 2019. If you have any questions about the Nā Koa Ali‘i Scholarship, please contact kuauhau@kamehameha.org.